We don’t talk about failure in leadership much do we? In our fast paced business environments with many challenges we focus instead on performance and delivery. It all about success and more success, leaders can’t be allowed to fail, can they? So, what happens to the leaders who do fail? We know in our hearts and from research that many of them do? I think they go quietly out of their role, in hushed tones, ashamed to talk about what went wrong in a world where success is so prized. We talk about them though don’t we? not to them but we do talk and wonder about their failure and how on earth it happened. And, how we can avoid it. Because deep down we may suffer from imposter syndrome, am I good enough? Will I be able to hold the performance of my team together? Will my company grow and survive this market? How will I navigate the choppy waters ahead? How the heck do I keep my life in balance and be great at work and at home also? Don’t kid yourself the odds are stacked against you also. With 40% of CEOs failing in their first 18 months and even more failing to live up to their company board expectations in the medium term. But, you don’t have to be on a leadership track based on the statistics. You should though start to expect failure and learn from it. Even get to a place of embracing the failure. I am not wanting you to become pessimistic and disabled by the thought of failing. I know that failing as a leader can be a catastrophic life event but it does not have to be. I want to suggest a new way of approaching failure. I believe that we all fail as leaders and we will go onto fail more as our careers progress. Even if we don’t make it out of the door, box in hand as the next big firing, if we are leading then we will fail at some point. In fact I suggest we need to experience failure to get success. We need to engage with the failure and learn from it. I also don’t actually think we will succeed unless we fail. Crazy but true, look at some of the great business leaders over the life of their careers. Take Walt Disney, failure after failure but that’s not the story we remember is it? His first animation company in 1921, he had to dissolve it as distributors didn’t pay him. Then Universal took his cartoon rabbit and claimed ownership and stole his Disney artists to work on it! MGM told him Mickey Mouse would terrify women on the big screen. He was told Three Little Pigs & Snow White would not sell. Pinocchio production was shut down due to spiralling development costs. When he did premiere it, his publicity was a disaster as the 11 people he hired got drunk, then stripped naked and ran around New York! He experienced failure upon failure, but he learnt from his failures. Failure brought him insights and wisdom that success would not and so he then went on to great successes. The ones we really need to worry about in business are those leaders who think they never fail. I know you have met them and recognise them. You definitely cannot fail around them as failure is seen as a moral failing. Then there are those who hold the badge of CEO but are not leaders but managers. You recognise them also as they were recruited for their technical skills. Maybe a finance or chief operating officer by background. They carry on like they did in their previous role and subtly use power and processes to coerce their organisation and staff. These are people that John Kotter (1990) would describe as transactional and not transformational. You work for them and ache to discuss vision, purpose and the impact that your organisation is having on the customers. Or worse still they are failing and have no idea of the failures they are presiding over or the impact of those failures on their staff or their organisations performance. They lack insight into the role of leadership and do not have the antennae leaders need to spot what is really going on. They have not developed their antennae because they never engage their team, do not look at themselves, they never ask for feedback and they never look at wider industry and its advances. Recognise that boss? So why do leaders fail? Are there some common characteristics. In a fascinating book “Lead like it matters because it does” published by McGraw Hill (2014) Roxi Hewertson, CEO of Highland Consulting Group and AskRoxi.com lists five reasons why leaders fail: Over or under confidence – not leading confidently and so not taking people with you or being over confident and rather too big for your boots. Approaching leadership with the wrong expectations – many leaders have a limited idea of what they are getting into when they take on a leadership role and don’t realise that growing and leading their team is key to success. Lack of training in the skills of the leader – leaders fail when they try to apply the technical skills they acquired on the journey to the role of the leader. It requires different skills now and they need to be learnt and mastered to succeed. Ignoring the need for a healthy team – leaders need a team around them, they need to build that team and develop healthy interpersonal relationships with and within that team,. They need to build trust and the will to follow them in others. They have to keep working at this listening and growing themselves on the way also. Failure to listen – leaders often feel they need to be directive, to have all the answers and tell not listen. They need to learn to listen, not to jump in, to reflect, to engage and develop the organisation to find the answers. 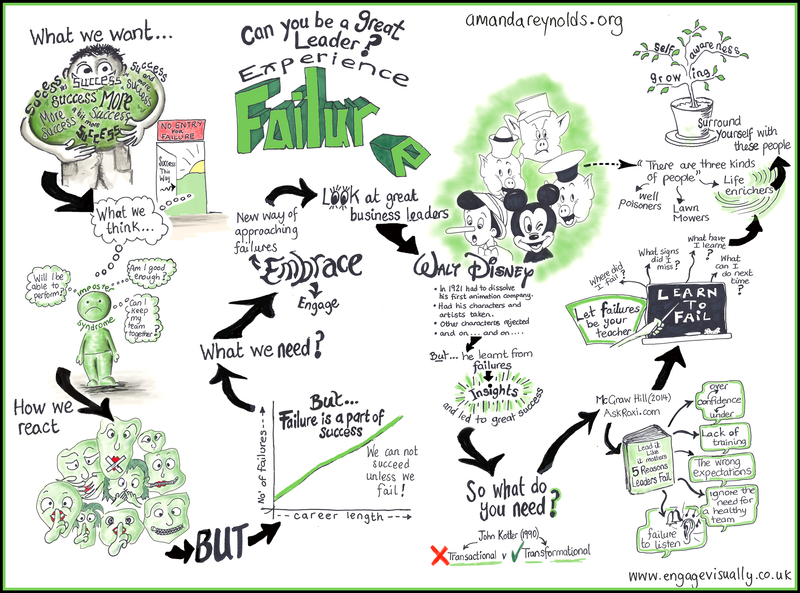 So, why is failure important, something to engage with and not run away from? As I stated earlier if we are truly leading we will fail, we will sometimes push too hard. We may be in a culture that does not fit well, not take people with us and not get the change happening. Leader don’t operate in a vortex so we might be failed by the business context or by our own organisation. We may have a vision and values not aligned or we might have an innovation or idea ahead of its time. Do not run away from your failure instead let the failures be your teacher. This is difficult I know as with a sense of failure often comes despair, guilt and a sense we are inadequate in some way. Those emotions are normal but failure is not an end, it can and often is instead a beginning. It just requires us to look at ourselves. Ask yourself, with the support of your coach: Where did I fail? Were the examples above speaking to me? Were there signs of impending failure that I missed? Were people trying to warn me and did I not listen? What have I learnt? How did this failure impact my values? What is my leaders vision and how do I stay on track? What can I do next time? Who should I have working alongside me? How can I turn this lesson into a success in the future? Then encourage yourself to try again, be easy on yourself, and others when you fail and keep talking about it. Surround yourself with “life enrichers” who will help you to rebuild and move forward. Walt Disney learnt to recognise business people around him. He described three types: “There are three kinds of people in the world today,” Disney said. “There are ‘well poisoners,’ who discourage you and stomp on your creativity and tell you what you can’t do. There are ‘lawn mowers’ – people who are well- intentioned but self-absorbed; they tend to their own needs, mow their own lawns and never leave their yards to help another person. This entry was posted in coaching, strategy on March 31, 2015 by areyns.